April 10 is National Youth HIV/AIDS Awareness Day, an event that raises awareness about the importance of engaging youth in the prevention and treatment of HIV/AIDS. About 1 in 4 new HIV infections occurs in youth ages 13-24 and 60 percent of youth with HIV do not know they are infected. While young people may tune out sexual health messages from the adults in their lives, they pay close attention to their peers. Youth voices and peer-to-peer education are potent weapons in the fight against the AIDS epidemic. This is why the APA/BET Partnership Youth Advisory Group has authored a guest blog post encouraging their fellow teens to know their status, seek information, and share the facts via social media: Stop the Virus by Going Viral. Make sure to share the post below with the young people in your life. This article was also cross-posted on the AIDS.gov blog on April 17, 2015. Imagine symptoms of a virus showing up, slowly causing patient deaths, and baffling doctors. Suddenly, this virus mutates and spreads, but remains undetected. More cases develop in many countries, then the world takes notice. Over thirty years later there is still no cure and it is still spreading rapidly in many places across the globe. This is the reality of HIV/AIDS and it’s having a huge impact among teens. Today, over 1 million people in the United States are living with HIV, and in 2010 U.S. youth aged 13 to 24 accounted for 26% of all new HIV infections. 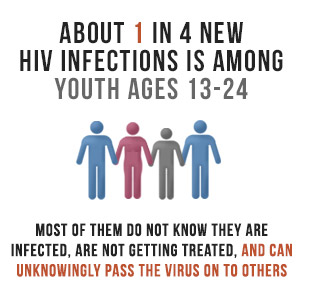 In fact, over 50% of youth with HIV in U.S. do not know they are infected. Part of the problem is that a great deal of youth don’t think it’s an issue for them. A 2012 survey of teens in U.S. by Kaiser Family Foundation found that most sexually active teens who have not been tested were not concerned about becoming infected with HIV. Many sexually active teens in U.S. don’t get tested; only 22% of sexually active high school students have been tested for HIV in their lifetime. Simply put, we see that HIV/AIDS is not on the minds of youth today. Learn more about how to prevent HIV/AIDS, the latest treatment and how to talk about HIV/AIDS with your friends, parents, guardians and partners. Social media is perhaps the most powerful form of media in existence. In the past, it was a stranger on television informing us about HIV/AIDS–now, it’s your best friend via Facebook, Instagram and Twitter. The power is in people in your everyday life. These people are able to share important information, so it resonates and is more effective than just an article in the paper or even a newscast on television. As we look towards the future of HIV/AIDS awareness and prevention, be a part of the social media solution; a tweet could save a life!